We’ve featured a lot of mums on our site that have done some pretty unusual things to bring on labour and get through the contractions. But this certainly tops them all, without an (eye)shadow of a doubt. A mother from New York distracted herself from the pain of contractions by painstakingly applying a full face of makeup right before welcoming her daughter. It’s not the usual contents of a maternity hospital bag. But when professional make up artist Alaha Majid arrived at hospital to have her baby, she brought with her a 35-shade eye shadow palette and a suitcase full of foundation, fake eyelashes, several brushes, a contour kit, liquid lipsticks and plenty more. And then she spent several hours during labour applying her makeup. Alaha delivered her daughter Sofia Alaya Karimi, on 15 February and the 27-year-old was her usual glamorous self, with fake eyelashes, heavy eye shadow and painted lips. “Yes, I went full glam,” Alaha writes on one of her Instagram posts. She even marked the occasion of her daughter, Sofia’s birth, by wearing “mink lashes in ‘SOPHIA'”. Whatever gets you through the pain, we say! Behind all the eyelashes and perfectly contoured cheekbones, Alaha admits that labour wasn’t as easy (or as pretty) as she made it look. 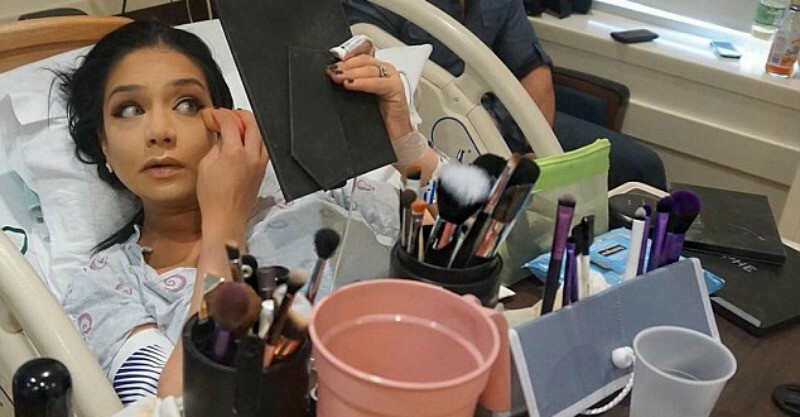 She snaps a few shots of her putting on makeup between contractions and even has her husband help her out when the pain becomes too much to hold the brush. Check out some of the other unusual ways mums spend the hours leading up to delivery, including going on a game show (aptly titled ‘Labor Games’) and doing the Tootsee.